I believe over vaccination is happening in dogs and this contributes to poor health and possible early death! Vaccinating a puppy for Distemper and Parvo is not Mandatory! But if done it should be done after moms immunity leaves the pups body and titer tested from there on! At a minimum of 26 weeks but preferable older they get a rabies vaccine! (As required by law). Any other vaccines in my opinion do too much damage and the benefits do not negate the disadvantages! I now titer for rabies also as our township accepts this as proof of immunity! The article below embodies everything I think about vaccines. Are you confused about how often your dog needs vaccines? You’re not alone … your vet probably is too. It’s the number one question we’re asked here at Dogs Naturally and it’s a good question. Because, as you’ll find out, most dogs are being vaccinated too often. And that’s dangerous. So let’s look at the core vaccines and what research has to say about how often they should be given. But before we do, you should first understand that the core dog vaccines (parvovirus, distemper and adenovirus) are not required by law. Only rabies is legally required in the all states in the US and some (not all) Canadian provinces. So apart from rabies, nobody can force you to vaccinate your dog with any other vaccine you don’t want to give. Period. This is a decision best left up to you and your vet. But before you decide, make sure you’re aware of the duration of immunity of those vaccines – and the potentially lethal consequences of over-vaccinating – because most vets don’t (but don’t worry, we’ve got a handout you can share with our vet at the bottom of this post). 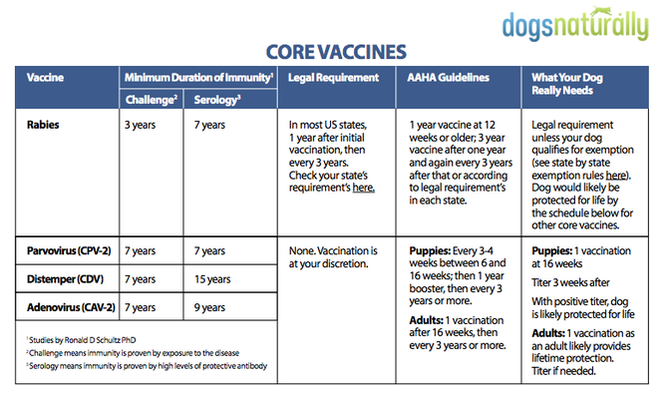 When it comes to immunity and duration of immunity for dog vaccines, there’s one clear expert. Dr Ronald D Schultz is one of perhaps three or four researchers doing challenge studies on veterinary vaccines – and he did these studies for 40 years. Below is the result of duration of immunity testing on over 1,000 dogs and on every major vaccine. It’s important to note that this is the MINIMUM duration of immunity. These ceilings reflect not the duration of immunity, but the duration of the studies. Dr Schultz has seen these results repeated over the years. In 2010, he published the following with newer generation, recombinant vaccines. It’s important to note that not only did the vaccines provide protection for a minimum of 4 to 5 years, it did so in 100% of the dogs tested. 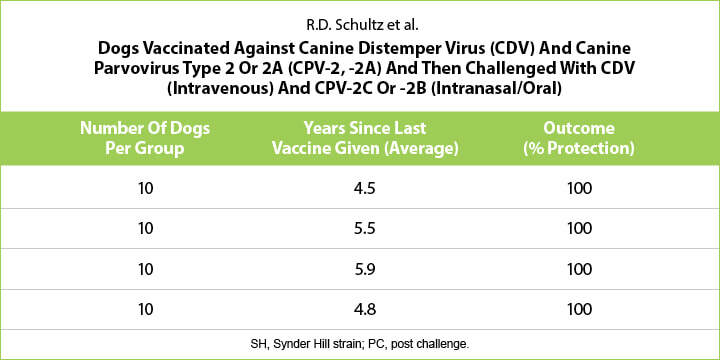 Dog Vaccines: The DangersWhy is it important to understand Dr Schultz’s work? Because dog vaccines can create very real health problems. Vaccines must be given only when necessary. Every vaccine has the potential to kill the patient or create debilitating chronic diseases including cancer and allergies. But the problem is, many vets are ignoring this research … and your vet is vaccinating your dog every year – or even every three years – he’s vaccinating too much! Your dog is already protected and the vaccine will give him all of the risk with no benefit. We now have inexpensive in-house titer testing (Vaccicheck and TiterCHEK) – titer tests will determine whether your pet has responded to his vaccines and formed immunity. With in-house titer testing, there’s never any reason to give any cat or dog over the age of 16 weeks another vaccine without a negative titer test first. Vets no longer have to guess at when to re-vaccinate. Dogs Naturally made this handy chart!